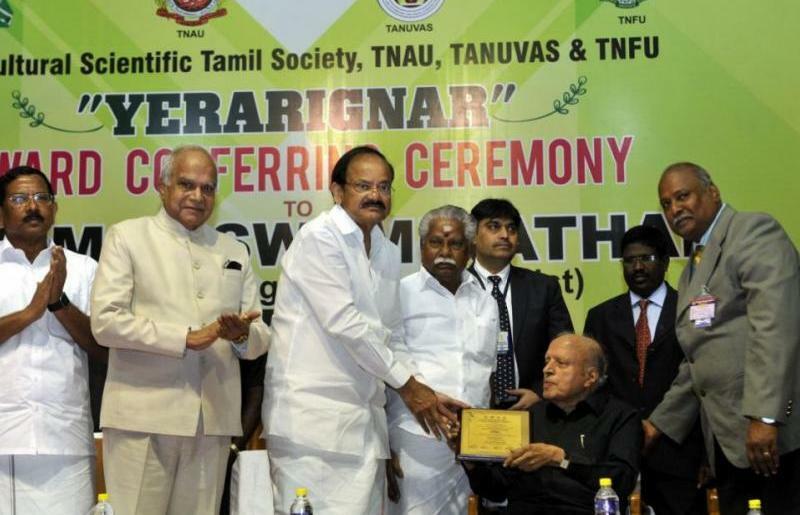 India’s Vice President Shri M. Venkaiah Naidu has conferred 'Yeraringan’ award to Prof. M.S. Swaminathan (Indian Father of Green Revolution) in Chennai. M.S. Swaminathan was a transformative leader who has inspired many scientists to focus on the problem of Indian agriculture. Mankombu Sambasivan Swaminathan (M.S.S) renowned for his leading role in India's Green Revolution a program under which high-yield varieties of wheat and rice seedlings were planted in the fields of poor farmers. In 1999, Time magazine placed him in the 'Time 20' list of most influential Asian people of the 20th century. The awards have been presented on the occasion of the first anniversary of the US Postal Service's issuing of a forever Diwali stamp last year. The Indian National Congress (INC) announced that Rahul Gandhi (47-year) has been elected unopposed as new Congress President. Rahul Gandhi succeeds his mother Sonia Gandhi (remained president for 19 years). The CEA (Central Election Authority) received a total of 89 nomination papers proposing Rahul Gandhi’s name for the top post. In January 2013, Mr. Gandhi became the vice-president of the party. Note: Rahul Gandhi is an Indian politician who currently serves as Member of Parliament, Lok Sabha from Amethi, Uttar Pradesh. The Union Health Minister JP Nadda has launched new initiatives including Laqshya-A Labour Room Quality Improvement Initiative and safe delivery application at a function in New Delhi. This will be implemented in Government Medical Colleges besides District Hospitals & high delivery load Sub-District Hospitals and Community Health Centres. The objective of this initiative is to reduce preventable maternal and newborn mortality, morbidity & stillbirths associated with the care around delivery in Labour room. Note: The Safe Delivery Application is a mHealth tool that can be used for health workers who manage normal and complicated deliveries in the peripheral areas. The Union Minister of Law & Justice and Electronics & Information Technology Ravi Shankar Prasad has launched the “NIC-CERT” in New Delhi, a setup of National Informatics Centre, Ministry of Electronics and Information Technology. The objective of NIC-CERT to create a comprehensive framework that integrates world-class security components and inbuilt threat intelligence for detection, prevention & incident response. The Women and Child Development Ministry have launched logo and tagline contest for National Nutrition Mission with prize money of one lakh rupees. It is an opportunity for citizens who aspire to see their design displayed on a National platform. The objective of the programme targets to reduce the level of stunting, under-nutrition, anemia and low birth rate. Participants can send either a logo or a tagline or both (the Last date to submit entries is 17th Dec 2017). The Centre has approved the National Nutrition Mission to ensure holistic development and adequate nutrition for pregnant women, mothers & children. According to the Chairman of (ICECTT) International Construction Equipment and Construction Technology Trade Fair Vipin Sondhi, the construction equipment industry is expected to grow at 14% after Union Government’s decision to spend over 10 billion dollars over next few years in the infrastructure sector. Sensing an opportunity, 927 exhibitors and 275 companies across the globe are displaying their products meant for the construction industry. EXCON 2017 trade fair will be organized in Bengaluru from 12 to 16 December. Recently, Mount Hope (in the British Atlantic Territory) was re-measured and found to tower above the previous title holder (Mt Jackson) by a good 50m (160ft). Mt Hope is now put at 3,239m (10,626ft) & Jackson is 3,184m (10,446ft). Mt Paget on South Georgia island is the highest mountain on a British Overseas Territory outside the Antarctic. Note: The map-makers at the British Antarctic Survey (BAS) were prompted to take another look at the mountains because of concerns for the safety of pilots flying across the White Continent. Saudi Arabia’s Minister of Culture and Information Awwad bin Saleh Alawwad govt. has announced the lifting of ban on movie theatres. Opening cinemas will act as a catalyst for economic growth and diversification. Saudi Arabia will have its first public cinemas in more than 35 years. The licensing process for cinema operators will start within 90 days and the films will be subject to censorship according to media policy standards of the kingdom. India bagged 21medals (six gold, eight Silver & seven bronze) at the 10th Asian Championship 10m Rifle/Pistol at Wako City Japan and also booked 4 Youth Olympic Games quotas. Saurabh Chaudhary and Manu Bhaker booked quota places for the 2018 Youth Olympic Games (YOG) by winning a gold and a silver each. Chaudhary has won both the individual as well as the Team gold in the men's 10m Air Pistol Youth event, while Bhaker clinched a silver in the women's 10m Air Pistol Youth. India claimed another silver in junior women's 10m Air Pistol. The union Sports Ministry has approved five lakh rupees from the National Welfare Fund for Sportspersons for former heavyweight boxer Kaur Singh. The Padma Shree and Arjuna Awardee boxer Kaur Singh struggling with treatment for heart disease and admitted at a private hospital in Mohali for nearly a month. Note: Mr. Kaur Singh winning a gold medal in the Asian games held in New Delhi in 1982 and also won two gold medals one each in Kings cup and Asian championships.